George III (George William Frederick; 4 June 1738 – 29 January 1820) was King of Great Britain and Ireland from 25 October 1760 until the union of the two countries on 1 January 1801, after which he was King of the United Kingdom of Great Britain and Ireland until his death. He was concurrently Duke and prince-elector of Brunswick-Lüneburg ("Hanover") in the Holy Roman Empire until his promotion to King of Hanover on 12 October 1814. He was the third British monarch of the House of Hanover, but unlike his two predecessors he was born in Britain, spoke English as his first language, and never visited Hanover. His life and with it his reign, which were longer than any other British monarch before him, were marked by a series of military conflicts involving his kingdoms, much of the rest of Europe, and places farther afield in Africa, the Americas and Asia. Early in his reign, Great Britain defeated France in the Seven Years' War, becoming the dominant European power in North America and India. However, many of Britain's American colonies were soon lost in the American War of Independence. Further wars against revolutionary and Napoleonic France from 1793 concluded in the defeat of Napoleon at the Battle of Waterloo in 1815. 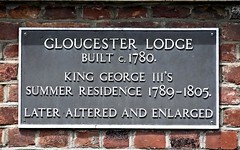 In the later part of his life, George III had recurrent, and eventually permanent, mental illness. Although it has since been suggested that he had the blood disease porphyria, the cause of his illness remains unknown. After a final relapse in 1810, a regency was established, and George III's eldest son, George, Prince of Wales, ruled as Prince Regent. On George III's death, the Prince Regent succeeded his father as George IV. Historical analysis of George III's life has gone through a "kaleidoscope of changing views" that have depended heavily on the prejudices of his biographers and the sources available to them. Until re-assessment occurred during the second half of the twentieth century, his reputation in the United States was one of a tyrant and in Britain he became "the scapegoat for the failure of imperialism". Frederick , Prince of Wales mother? Bayshill House Sidney Lodge stands on the site of Lord Fauconberg's house where King George III stayed in 1788. 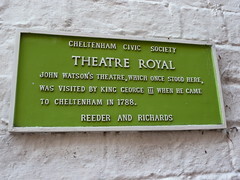 Theatre Royal John Watson's theatre, which once stood here, was visited by King George III when he came to Cheltenham in 1788. 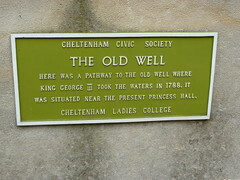 The Old Well Here was a pathway to the old well where King George III took the waters in 1788. 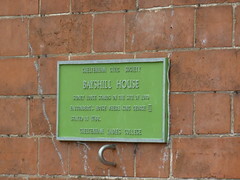 It was situated near the present Princess Hall. Boulton and Watt Engine The oldest rotative steam engine in the world. Built in 1785, it powered Whitbread's London Brewary until 1887. James Watt demonstrated this engine to King George III when he visited the brewary in 1787. This engine marks the start of mass industrialisation and the exponential increase in our use of fossil fuel. The Kings Arms This historic 16th century inn had Georgian renovations in the 18th century and a Victorian attic in the 19th century. 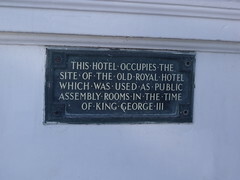 King George III stayed in Weymouth in 1789, on doctors orders. He was taken across the Esplanade by a horse drawn bathing machine and a small orchestra would play "God save the King" as he stepped into the water. 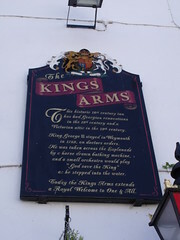 Today the Kings Arms extends a Royal Welcome to One & All. The First Duke of Northumberland. The first Duke of Northumberland was born here in 1712. Formerly Sir Hugh Smithson, he married Lady Elizabeth Percy & succeeded her father as Earl of Northumberland in 1750. He was made Duke of Northumberland in 1766 being the only Duke created by George III. The Duke retained a lifelong interest in & contact with his birthplaces Northallerton. George's Meeting House These premises were purpose-built as a Unitarian chapel in 1760 and named after George III, who came to the throne earlier that year. Reputedly, the pulpit in this building belonged to James Meeting, built in James's street sometime after 1687. It is thought that the pulpit was brought here when James's Meeting closed in 1760. George's Meeting closed in 1983. 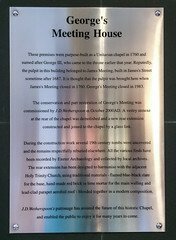 The conservation and part restoration of George's Meeting was commissioned by J.D. Wetherspoon in October 2000AD. A vestry annexe at the rear of the chapel was demolished and a new rear extension constructed and joined to the chapel by a glass link. During the construction work several 19th century tombs were uncovered and the remains respectfully reburied elsewhere. All the various finds have been recorded by Exeter Archaeology and collected by local archive. The rear extension has been designed to harmonise with the adjacent Holy Trinity Church, using traditional materials - flamed blue-black slate for the base, hand-made red brick in lime mortar for the main walling and lead-clad parapet aerofoil roof - blended together in a modern composition. J.D. Wetherspoon's patronage has assured the future of this historic Chapel, and enable the public to enjoy it for many years to come.